I was startled yesterday as Chris and I were working around the house. 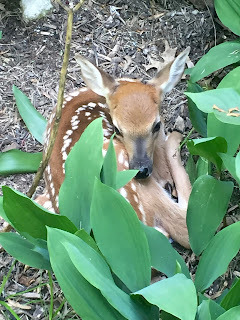 We had been outside about an hour when as I rounded the corner on the side of the house nearest the wooded area, there nestled under the lilac bush and in the Lily of the Valley patch was a fawn. Hiding in almost plain sight, but very quiet and still, was Bambi! We have a small herd of deer that traverse the wooded area behind the house and love to eat our plants. After discussing the situation with Chris and phoning a friend for some advice, we decided to clear the area and suspend our outdoor work for a couple of hours to see if its mother would return to retrieve the fawn. I searched the internet and ran across an extremely informational site that set our minds to rest about the situation. 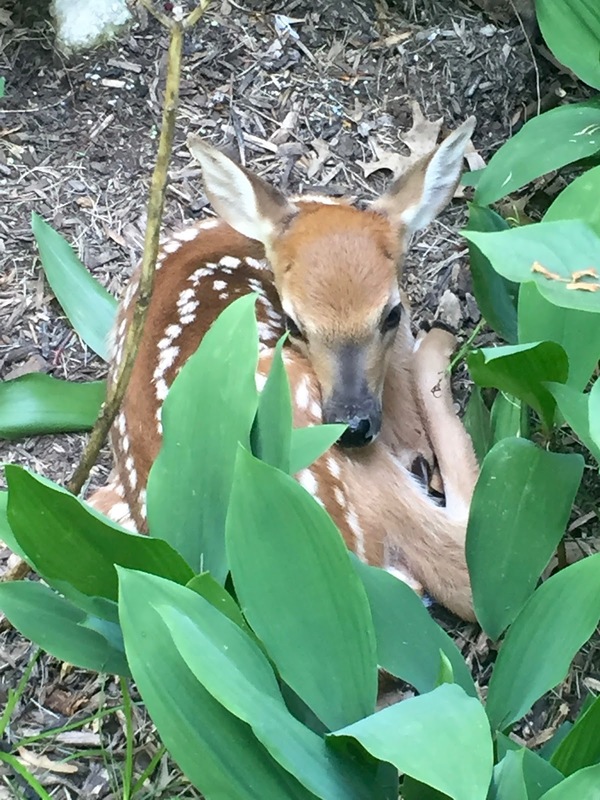 We learned that the fawn had probably not been abandoned and was not in any distress. I highly recommend reading this document titled, Do You Know How To Tell If That Fawn Really Needs Your Help??? It answered all of our questions and reassured us that the situation would resolve itself. The most important thing we learned from our reading was that this would probably be an all day event. The doe would likely not return until dusk. We also learned that the fawn was less than three weeks old. The fawn stayed in its spot all day. It was quiet, but aware, and only moved when its location came into full sun. It moved three feet to more shaded spot under the lilac bush. We checked on it throughout the day and kept the dogs and kids away from it. We did advertise its presence to the neighbors who took some pictures, but did not otherwise disturb the small fawn. Sometime between about 6:30 and 7:30 PM, the fawn disappeared. The house and the yard had been quiet for a couple of hours and we believe that its mother returned and took it away into the woods. We had hoped to catch a glimpse of mother and fawn together, but alas, it was not to be. While we enjoyed our wildlife encounter because it added a different dimension to the weekend, we hope it doesn't return for another day for free babysitting. I checked the area this morning and as of 5:49 AM, the fawn had not returned. I have no idea whether deer reuse the same spots. I know that they traverse the same paths. And that is the story of our real world encounter with Bambi.